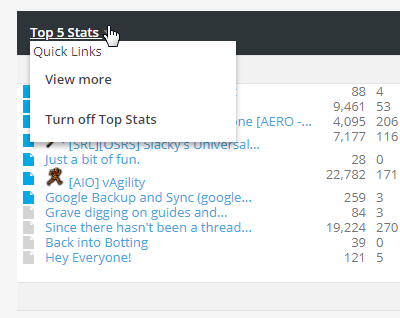 Is it just me or is the latest post box that is located in the bottom on the main page (villavu.com/forum/) missing? Please let me know if there is a button I need to click to get it to display. note: I have attached a screenshot (1.PNG) of what I see. edit: maybe you can enable it here? edit 2: maybe you can only enable it again on another theme perhaps? You have no permissions to view this page. Can you please advice? It is pretty hard for me to keep up to speed with the latest threads/posts. It is pretty hard for me to keep up to speed with the latest threads/posts. Doesn't address your root problem, but perhaps can band-aid it for you in the meantime. Turp's Awesome Player Owned Port Timer!!! Thank you, I have been using this feature but still not fully satisfied.